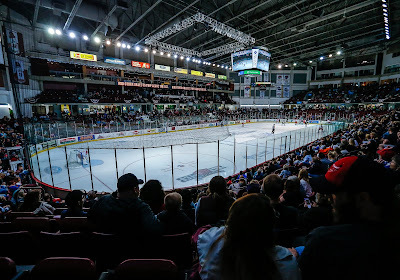 Today's post begins ECHL Week on 100 Degree Hockey, a series of stories that came from my weekend visit to Boise from January 12-15. Today's article will cover the arena experience in Boise. Tomorrow I'll be doing a long-form bio of coach and GM Neil Graham. I'll round out the week with a profile of emergency backup goalie Doug Melvin, some insight on playing in the ECHL when you're only experience has been in the AHL and finally the economics of actually being an ECHL team. I won't claim to be a connoisseur of arenas across even the AHL. In fact, my visit to CenturyLink Arena in Boise was only the second building I've visited in the ECHL. Even with that said, I believe that the arena and the experience that the team puts together for its fans are both high quality and well-matched to the audience in the building. The first thing to know about the arena is that it is in downtown Boise. Similar to what the Dallas Stars have in Victory Park, the arena is surrounded by restaurants and bars that provide opportunities for both pre- and post-game revelry. The arena is actually connected to the Grove Hotel, arguably the best hotel in the city, and the team is owned by the same group that owns the hotel. As you walk into the hotel from the valet parking area, there isn't much indication that there is an entire ice sheet hiding right behind the lobby. However, once you step through the doors to the rink, you can basically see everything there is to see in one glance. I don't mean this as a sleight, to be sure. The compactness of the arena is what makes it work. The arena seats nearly exactly 5000 people, and the Steelheads pack the barn regularly. Their 80% capacity mark of around 4,000 would be the equivalent of approximately 5,500 at the H-E-B Center, a mark the Stars have never hit for a full season. There are a few elements that make the arena unique. First of all, the connection to the hotel makes for some interesting cross-promotion opportunities. Toward the top of the arena, there are several balcony-type private suites. It turns out these are connected to suites in the hotel, allowing you to combine your hotel and evening entertainment in one neat package. Another interesting layout item is that the arena does not have a concourse. After the initial rows of seats, there is a landing where all of the concessions take place. You can stand in line for your beer and watch the game live, not on the TV screen. Above the press area, there is a bar with a direct view down to the ice surface. In fact, many times the announced attendance looks off from the butts in seats because season ticket holders post up in the bar for the game. Speaking of season ticket holders, the team treats all season ticket holders to free dinner each night in their season ticket holder lounge. This overlooks the plaza behind the hotel, not the ice, but it's still a very nice bonus of being a season ticket holder. Idaho has an excellent social engagement strategy that is reinforced by their in-arena promotions. Using their hashtag, this year #FeeltheSteel, in a photo post on Instagram, Twitter or Facebook will likely put you on the big video board that runs constantly throughout the game. This is a dedicated board for social media engagement, and it works. Next time there is a Steelheads home game, punch in the #FeeltheSteel hashtag to get a live look at all the folks at the game on social media. As with any social engagement, this creates a great connection to the team for casual fans and encourages repeat visits to the arena. My final word on the arena experience was that the people were all wonderful. I got a chance to meet a number of folks who have been reading the site for years. I really appreciate your readership, and it was great to meet each of you. I even earned at least one new reader after a season ticket holder saw the 100 Degree Hockey seat in the press area and looked up my site Friday night and told me all about it on Saturday. Tomorrow: a long-form look at the duality of the ECHL head coach/GM role and Idaho's man in that role, Neil Graham. Great opening to the series! I've always been interested in the experience in Idaho. I'm looking forward to the rest of the story.